[button-red url=”http://www.mcrrc.org/jeremys-run-10k” target=”_self” position=”left”] 10k Results [/button-red] [button-red url=”http://www.mcrrc.org/jeremys-run-5k” target=”_self” position=”left”] 5k Results [/button-red]Just minutes prior to wiping off sweat, many runners were wiping tears. During an emotional pre-race ceremony, Jeremy’s Run Race Director Cyndi Glass lit candles to honor those in drug addiction recovery and as a symbol of hope for those suffering from drug addiction. 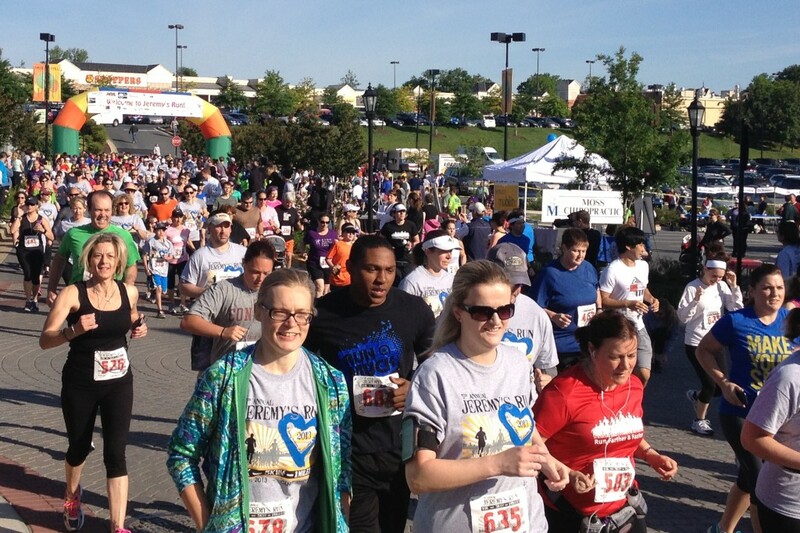 The fifth annual Jeremy’s Run consisted of a one-mile fun run, 5k and 10k. Hundreds of runners and members of the community came out to support the race and cause that was dedicated to Jeremy Daniel Glass and others who have died of complications from drug addiction. Glass, who is Jeremy’s mother in addition to race director, said she appreciated the turnout, which has continued to increase over the years. This year marked Stephen Raye’s second year participating in the race. Raye participated in the 5k and has a son who suffered from drug addiction. He said he came out to show his support for the important issue. Corey Graeves of Silver Spring, Md. took advantage of the first half of the downhill 5k course to take the lead within the first half mile. Though Graeves said the slight uphill on the way back to the finish sort of “broke” him, he finished 1st place with a time of 17:16. In the women’s division, Audrey Perlow of Arlington, Va. also held the lead for the majority of the race. Finishing with a personal best time of 19:41, Perlow said she was happy to see the community come out to support the cause. The 10k overall winner, Aaron Anderson, of Germantown, Md., took the lead with one mile left to go. He finished with a time of 34:55. The 2011 1st-place finisher in the Jeremy’s Run 5k said that he has recently increased his mileage because he is training for a shot to compete in the 2016 Olympics. Vying for the overall women’s 1st-place 10k trophy was Katelyn Rogus and Megan Llewellyn. Rogus had the home-turf advantage having grown up within a few blocks from the starting line and took home the 1st-place trophy. Though Galliani has been running for nearly 25 years, she said that she felt a calling to compete in Jeremy’s Race. A mother of teenagers, she added that the race website brought her to tears.